Is the Ocicat the Right Cat Breed for You? Is the Ocicat right for you? 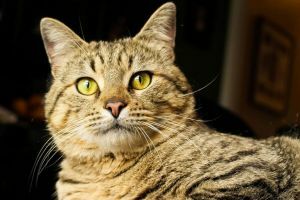 The Ocicat may look wild with a wild-sounding name, but this people-loving feline is all domestic, the result of crossing Siamese, Abyssinians, and later American Shorthairs. The Ocicat loves people, even strangers, so this is a cat you can show off proudly to friends. Ocicats are intelligent and engaging, and love spending time learning tricks – some have described them as being downright dog-like. Though the Ocicat has a low maintenance coat, this is not necessarily a low maintenance cat. High intelligence and social needs means this feline will not be content to spend a lot of time alone. Furthermore, this athletic and agile cat will explore every last nook and cranny of your home, and if not given their own furniture to climb on, will choose some of yours. They are dynamic and devoted companions, and you’ll never be without a friend if you invite an Ocicat into your home. The Ocicat is a moderately large, sleek, and athletic cat best known for their spotted coat. They are well-muscled with a medium build, a deep chest and a somewhat long body. The legs are medium to long and strong. The tail is fairly slim with a slight taper. Atop the gracefully arched neck is a head of proportional size, moderately wedge shaped with a squared muzzle. The ears are moderately large and set somewhat to the sides of the head. Some Ocicats may have lynx tips. The eyes are large and almond shaped, slightly angled, and may come in all colors except blue. The Ocicat’s short coat is smooth and close-lying, satiny with a glossy sheen. Their distinctive coat comes in 12 colors, all featuring dark spots on a lighter background. The hair has banding, or ticking, where the dark tips form the markings and the light tips make up the base coat. There is a distinctive “M” marking on the forehead with stripes trailing down the back of the head. Rows of round spots line either side of the spine from shoulders to tail, and spots are scattered across the body, including the legs and belly. The eyes are dark-rimmed and then outlined by the lightest coat color. The Ocicat comes in shades of tawny, chocolate, cinnamon, blue, lavender, fawn, ebony silver, chocolate silver, cinnamon silver, blue silver, lavender silver, and fawn silver. The Ocicat is an outgoing, friendly, and sociable cat. They are quick to warm up to strangers, so don’t be surprised if your Ocicat crawls into your guest’s lap. They are active and play and love to have a large collection of toys. Take note, some Ocicats may become possessive of their toys, and you may even find yourself in a game of tug-of-war if you try to take them away. Intelligent and confident, they respond well to training and are quick to learn tricks. Some may even be amenable to feline agility training, especially if they are toy-driven. Puzzle toys may be another worthwhile purchase for this clever cat. As family pets, Ocicats generally do quite well. They’re adventurous and playful, and very tolerant of children. They adapt well to their environment, so they don’t mind a slightly chaotic home. What will make the Ocicat unhappy is being left alone for too long. This cat craves socialization, so if you don’t have the time to devote to the Ocicat, you may want to consider another breed. Because of their Siamese heritage, some Ocicats can very vocal.